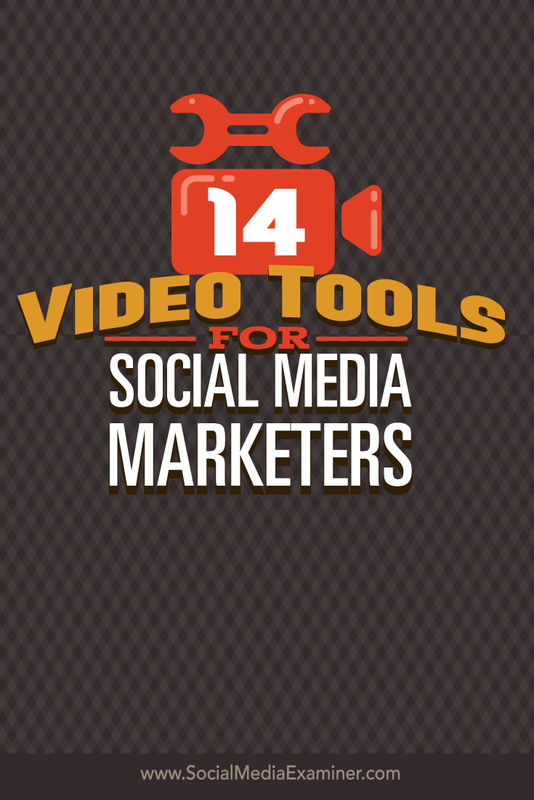 Do you want to add video to your social media marketing? Are you looking for tools to simplify your video production? Today’s tools make it easy to record and edit videos for social media marketing and ad campaigns. In this article I’ll share 14 tools marketers can use to create screencasts, montages and slideshows. 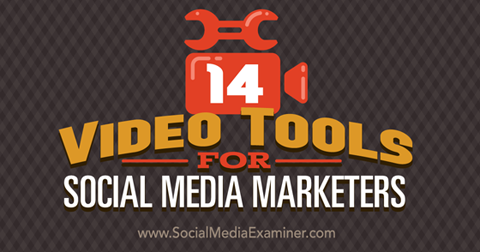 Discover 14 video tools for social media. According to Facebook’s Q3 2015 earnings report, there are now 8 billion daily video views on Facebook, double the video views in April 2015. Plus, with the launch of 30-second Instagram video ads, it’s easier than ever to create video ads to use for both platforms. There is a perceived high barrier to creating video, however. People who appear on camera want to look and sound their best, and they want to use the best technology to record audio and video. Plus, many women in business (myself included) want to spend time on hair and makeup before hitting the record button. Fortunately, there are easy ways to create video, some of which don’t even require showing your face on-screen. You can use screen captures, images and video clips to create video ads for your business. Here are some excellent desktop and mobile tools you can use to create Facebook and Instagram videos. A screencast is a digital recording of the action taking place on your computer screen. It’s the perfect solution for creating technical how-to explainer videos, narrate slides about a specific topic, give a guided tour of your website or create a tutorial or demo for your product. You can record and edit screencasts using the following tools. Camtasia Studio, available for both PC and Mac, is an advanced video recorder and editor. It allows you to smoothly record whatever part of the screen you need to show, down to the pixel. 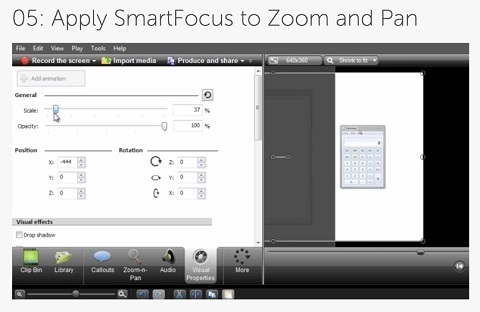 One very useful feature is SmartFocus, which allows you to zoom in and out, as well as pan. Camtasia Studio allows you to apply zoom and pan to your videos. Zooming in is especially important for videos, since more than 80% of people consume their Facebook news feeds on their mobile devices. Remember, ensure your text is large and clear enough for people who are watching on the go. ScreenFlow is easy-to-use screen recording and editing software for Mac and my personal favorite. ScreenFlow allows you to record your entire screen while also capturing your video camera, iOS device, microphone and computer audio. Add text to overlay and a watermark to brand your videos. Use pan and zoom, add transitions and import other media to make your videos look as professional as possible. While Snagit has video recording and screen-capture ability, it doesn’t have the extensive editing features of other software. If you’re looking for an easy, lower-cost solution, this is an excellent option. Snagit has customizable arrows, blur, colorful speech bubbles and other mark-up options, as well as video trimming, special effects and more. 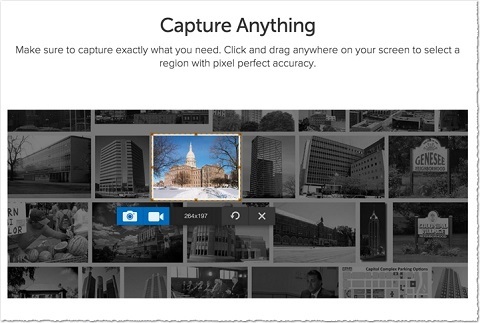 To capture from your screen, drag Snagit’s crosshairs and then choose a still image or video. If your screencast software doesn’t already have mirroring for your mobile device or you simply want an easy way to send images and video between devices, you can add that functionality with one of the following two applications. Reflector by Squirrels allows you to do wireless mirroring, so you can display your smartphone screen (Android or iOS) on your desktop. Connect your mobile device wirelessly to your desktop, hit Record on your screencast software and create your video. This video was created using ScreenFlow and Reflector. NEW Facebook Mobile Video Features!Have you seen the new Facebook video features coming to mobile? Check out this special video tour to see these features in action: new video News Feed (with dedicated icon front and center – this is HUGE!! ), multi-tasking (watch videos while still scrolling through your regular News Feed), suggested videos, 360 videos, save videos and, of course, VIDEO ADS! Plus, video matching technology to help reduce pirating (‘Freebooting’) – yay!! ● Facebook video views has grown from 1 billion per day in September 2013 to over 4 billion per day today. ● 75% of video views on Facebook are on smartphones, compared to YouTube with 50% of video views on phones. ● A video view on Facebook counts as just 3 seconds. ● Revenue sharing from Facebook video ads is coming. Video content creators will receive 55% of ad revenue…. BUT, that will be divided among all the video content creators that appear adjacent to the ad, based on how long users watch each video. This tool is perfect for anyone who does online training, such as app developers, technical trainers and industry experts. Combine still images into a slideshow as a catchy video promotion for your news feed. 287-TAXIHere’s a 10 second ad we did for our favourite taxi company 287-Taxi/ Campbell River Airport Shuttle This will play at YBR on the display screens. We create ads for LED billboards, theatres and airport screens. These ads work great on social media too. Love working with Casey and the team Immediate Images – they are provide the digital signage. If you need to get the word out talk to Casey. Another way to do a demo is to walk people through a step-by-step of how your business, products or services work. A slide-deck video can also feature products on a theme, behind-the-scenes images from your company, coverage of events and more. Add transitions and narration to put everything together into a nice, professional video. Spice things up with some video clips, too. For basic editing of images into video, you can use iMovie for Mac or Windows Movie Maker. 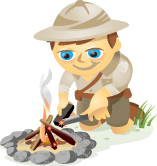 Both applications allow you to import images and clips and edit them into videos. 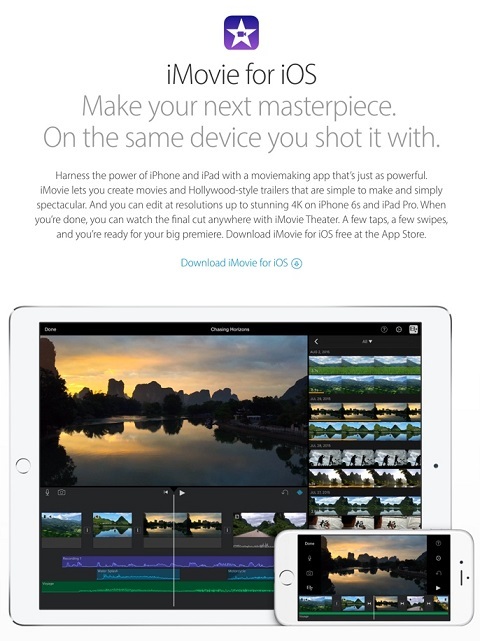 Apple’s iMovie has come a long way and works with all of your iOS devices. Then put them in order, insert transitions, record narration and produce your video. 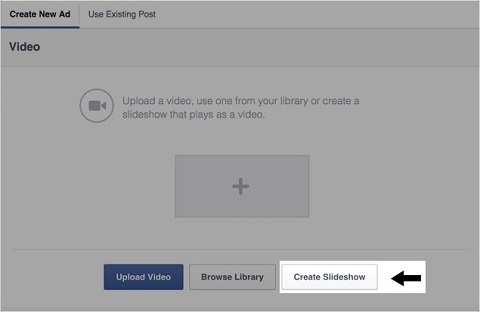 The Facebook Slideshow tool recently rolled out to Ads Manager and Power Editor. If you have limited time and resources, it’s an easy way to create eye-catching ads from still images. Facebook Slideshow is available for all of the objectives highlighted in the screenshot below. 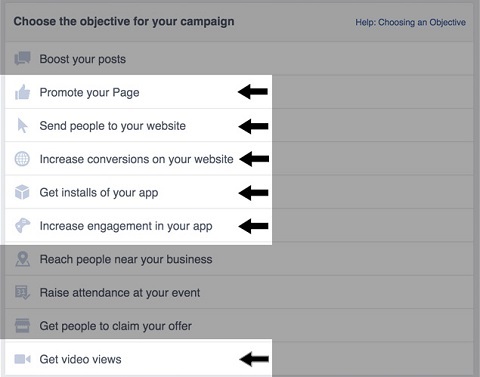 Create a simple slideshow using any of these Facebook ad objectives. In the Ad Creation section, click on Select Video and then the Create Slideshow button. Facebook’s Slideshow tool is simple and easy to use. Select three to seven images (use Facebook stock photos or upload your own). Then choose the length of the ad (up to 15 seconds), transition preference and thumbnail. For best results, use high-quality images and avoid grainy ones. For dimensions, keep them all the same, ideally 1280 x 720 pixels or an image ratio of 16:9 or 4:3. If you use images of different sizes, your slideshow will be cropped to a square. Slideshow video ads are for advertisers who want an easy way to create a high-quality video without the hassle or expense of video production. You can get more help with Facebook slideshow video ads here. Similar to the Facebook Slideshow video ad tool, another way to create videos for ads is to use a service that automatically edits your video into a montage. Intersperse video clips with your images, overlay text and add music. These tools help you build appealing videos for your audience. Animoto allows you to create videos in three easy steps. First, pick a style for your video. Then select photos and video clips, add text and choose a song. Finally, produce (finalize) the video and share it on your website or social channels. 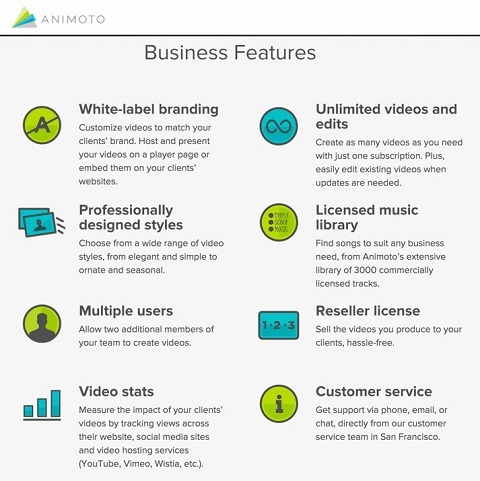 Animoto also offers a business-level option for agencies and marketing consultants. Animoto is a web-based tool, and also has apps for Android and iOS. 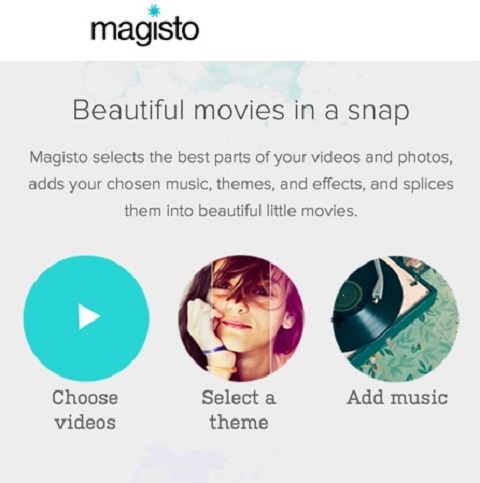 Magisto is a free app that automatically turns your everyday videos and photos into beautifully edited movies. It’s perfect for sharing on social channels and using in video ads. Magisto uses its own Emotion Sense technology to create a video trailer from the best parts of your video footage. You provide the footage and Magisto analyzes it and puts it together in a way that elicits an emotional response and tells a story. Magisto makes it easy to create professional-looking short-video montages. Magisto is a web-based tool with Android and iOS apps, though you currently can only edit movies that have been produced with one of the mobile apps. Turn your story into a stunning animated video in minutes with Adobe Voice. The app is available only for iPad and is easy to use. Pick from a collection of 100,000 images or use your own. Touch to record your voice, one line at a time. Voice automatically adds cinema-quality animation, so your story looks incredible and is perfect for the business world, too. There are several tools you can use to create movement in the Instagram or Facebook feeds of your target audience without spending time recording a screencast or doing a fancy video shoot. These apps are mobile-only. Combine still images and videos from your mobile device to make a Flipagram. You can record voice narration, choose from Flipagram’s music or upload 15 seconds of music you already have on your mobile device. Flipagram compiles everything into a quick video you can share in your feeds. This app is one of my favorites. The Diptic app is another video tool for making collages that has a newly added animation feature, which works with transitions. This is an easy and fun way to make a statement in your business’s Instagram feed. Brands are using the Boomerang app already. Using even one or two of these types of videos in your Facebook or Instagram marketing and ad campaigns can help improve your visibility, reach and conversions. Do a screen recording or compile images into a slideshow or montage. Create your content on desktop or mobile, whichever is easier for you and your business. With Facebook’s Autoplay feature, the movement is eye-catching. If you can, consider adding subtitles to draw in your audience so they’ll want to click the audio. Or just create powerful video ads that stand alone with or without sound. You’ll be surprised at the impact a video ad can make. What do you think? Do you create video ads for Facebook and Instagram? What are your favorite tools? Do you have any video tips? Please share your thoughts and experience in the comments.